Exchange 2013 CU6 – OWA – Something Went Wrong?!? Brand new Exchange 2013 CU 6 server. Shiny. All URLs configured. OWA works? Not so much. “Something went wrong”. Really? That’s all I get? Thanks for the non-descriptive error message. Click on the “More Details” button and you see? Note the “The system cannot find the file specified. (D:\Program Files\Microsoft\Exchange Server\V15\ClientAccess\owa\web.config line 110)”. This would seem to point to a missing file or permission issues. In my clients case, neither of these was the case. What else could cause this issue? Well, as it turns out, CU6 changes the way the web.config file is used by OWA %Program Files%\Microsoft\Exchange Server\V15\ClientAccess\Owa). In the case of my client, we were missing this sharedwebconfig.config file in the “Program Files\Microsoft\Exchange Server\V15\ClientAccess” directory. There is a second sharedwebconfig.config in the “Program Files\Microsoft\Exchange Server\V15\FrontEnd\HttpProxy” directory as well. Once there was a good copy of the file, I ran an ‘iisreset /noforce’ for good measure. OWA was now working as expected. There is not a lot of information in TechNet, EHLO blog or MSDN as to why this file split was done or why it was necessary. After speaking with Microsoft, it appears that it was done for stability reasons. They are having trouble reproducing this error and they have not, as of this writing, declared it a bug. If I hear anything else, I will post it here. Here is the other blog post on this issue. There are some rumblings in the forums as well. Once again, incredible issues with Exchange setup. Same issue with a fresh Ex2013 CU7 install..
You, sir are a hero. I had been fighting this issue for about 8 hours (clean install of 2013, migrating from 2007 as well). I had read miles of articles to no result. I ended up having to create the file starting with a copy from another client, but as soon as it was there, OWA finally worked. Same BUG with my clean new installation! Just copied sharedwebconfig.config to “Program Files\Microsoft\Exchange Server\V15\ClientAccess”, restarted IIS and now it works. THANK YOU!!!! Echoing everyone elses comments – thank you! I did greenfield install with CU7, and had this issue. In my opinion – this is a stupid problem to have. The installer should never have passed QA if it was installing files that reference other files, and the referenced files are not created in the correct places. Thank you Damian, you saved my life! I confirm that this issue is still present in CU8…. Thank you! You saved me hours for troubleshooting. Thank you! This resolved my problem as well. Again, another CU8 install. After a fresh CU9 install, SharedWebConfig.config file was missing. Thank you for pointing me to the right direction! I can confirm that we had the same issue after a fresh CU9 install. You sir are the man. This saved the day and ended a very frustrating night on a good note. Believe it or not, I just built a CU9 server for a cross forest migration test and I had the issue again. First time with any build since CU6 for. My words are the same of my collegues. You saved my day. This worked for Exchange 2016 with a fresh install. I came across the same issue and fixed it. 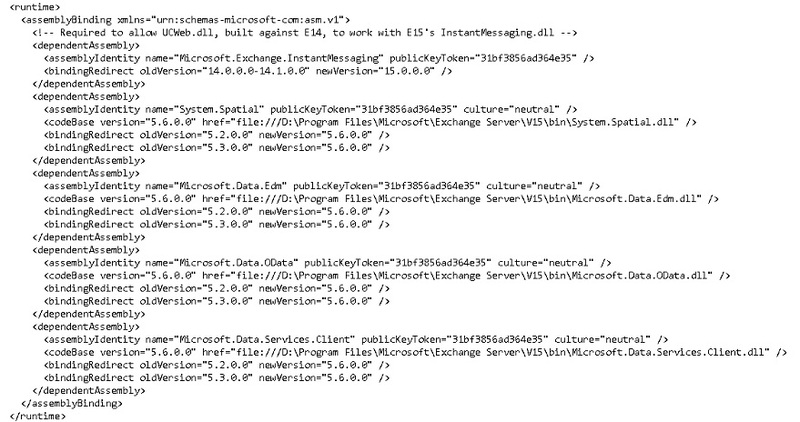 By looking into it deeper, I learned that it only occured on the server which got Exchange 2013 CU9 installed first. The Exchange 2013 servers installed after that did not exhibit the same problem. Doublechecking this theory in a second brand new installed (not configured yet) environment showed the exact same behaviour. So in my opinion only the first installed Exchange 2013 server exhibits this phenomenon. Does CU6 maybe the solution to the problem outlined in the article: https://support.microsoft.com/be-by/help/4018464/can-t-connect-to-exchange-server-2016-using-chrome-or-firefox? To check you just need to open owa in chrome or firefox. Anatoly, this article is for Exchange Server 2013’s CU6, which was released a few years ago. For the link you provided, you are referring to Exchange Server 2016’s CU6. I didn’t see it in CU6’s release notes but I would consider applying CU6 as CU6 provides some useful feature updates and the KB you mentioned does explicitly state that CU6 will fix the issue. With your issue, it certainly won’t hurt. After sleeples night, THANK YOU for this post. Many other solutions not worked. BTW, i updated Exchange 2016 CU5 to CU6, and got this OWA error: X-FEServer, how i love that all night long , tnx you Microsoft.